Terms | Marlin Crawler, Inc. Here at Marlin Crawler we make every effort to simplify what we do so we can get our products out on the trail where they belong. Our 25-years of service and support has given us a deep understanding of the off-road industry. Below are our Terms and Conditions that every customer accepts before each purchase. If you have any questions or concerns then please give us a quick call or shoot us a message! Thank you and Happy Crawling from the Marlin Crawler Team! We strive to ensure every order is properly fulfilled. When you receive your order, please verify that all parts are present and not damaged during transport. Marlin Crawler must be notified immediately of any missing or incorrect parts. Inspect the parcel for loose items before disposal. Ensure correct parts were shipped BEFORE disassembly of your vehicle. If the order is incomplete, please contact a sales representative at (559) 252-7295 or online via our Contact Form. UPDATE Nov 2018: We are now using UPS for all domestic and international orders. We are unable to ship UPS to a P.O. Box. We offer second day and next day air delivery. We make every attempt to send each order out in a timely fashion, however same day shipping is not guaranteed. Delivery Signature Confirmation is available through Phone-In orders only. COD orders are subject to an $8.00 UPS charge. If an e-mail address is provided, we can send you the tracking number. Once FedEx has picked up the package, they are responsible for it and the delivery time. Refunds for late, next day or 2nd day air packages are subject to a UPS claim. 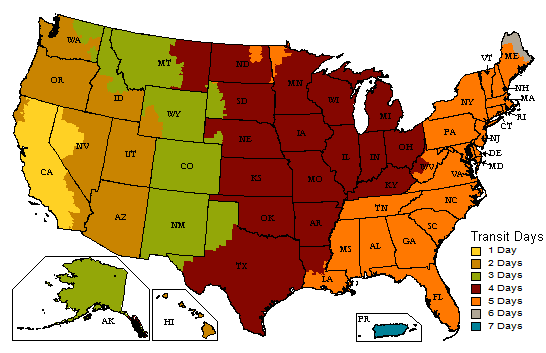 UPS Standard Ground Transit Times - This map represents UPS Standard Ground shipping times after your package has left our warehouse. Your billing information must match the billing address for the credit card used or we will be unable to process your payment. We no longer accept American Express cards because of their business-unfair practices. You may still use your AMEX card, however, through your PayPal account. We accept VISA, MasterCard, Discover, and PayPal which includes eChecks, and American Express! PayPal is an extension of our service that we offer to our online customers. We cannot accept a PayPal payment for a call-in order. PayPal is only available for online orders. UPDATE: Due to difficulties with PayPal holding eChecks, we are no longer accepting eChecks through PayPal. A Marlin Crawler Coupon Discount Code is an online service that we provide to our online customers. Codes are randomly sent in our Online Newsletter, and sometimes may be found through other online advertising. They are redeemed during checkout of an online order on this website. Discount Codes are only available for online purchases, no exceptions. Our system simply cannot accept Discount Codes over the phone or in person. Discount Codes do not apply to products that are already on sale, unless noted otherwise. Only one discount code may be used per customer, unless noted otherwise. Once a Discount Code has expired, it is no longer available. Discount Codes are an extension to our online services, and we reserve the right to remove, change, expire, or otherwise refuse a Discount Code to any order at any time and for any reason. California residents: Our website currently does not adjust the tax rate which should be calculated after the discount(s). Our internal sales software however does indeed correctly calculate this. Therefore, your final order amount will reflect the post-discount tax rate resulting in a lower due amount. If any mistakes were made, please contact us and we will promptly take care of it! Thank You!! Purchasing Information may be found by visiting the CRAWL CARD catalog page. CRAWL CARDs are assigned to the recipient's customer account. They may be redeemed through call-in, walk-in, or online orders. In order to redeem for an online order, the serial number of the CRAWL CARD(s) must be entered in the Order comments text-field at the bottom of the checkout page. Only valid for products and services as listed on this website. Purchases are deducted from each CRAWL CARD balance, and any unused balance remains on the recipient's CRAWL CARD account. If the purchase amount exceeds the CRAWL CARD amount, the balance must be paid with another credit card or other available payment method. The owner may check his or her balance at any time over the phone. CRAWL CARDs cannot be used to purchase other CRAWL CARDs, and may not be applied to the order from which it is being purchased. Additionally, CRAWL CARDs cannot be reloaded, resold, transferred for value, redeemed for cash or applied to any other CRAWL CARD account. There is no expiration date for CRAWL CARDs. However, once the remaining balance is exhausted, the CRAWL CARD is considered consumed and no longer holds any value. We maintain a record of each CRAWL CARD balance. If a CRAWL CARD is lost or destroyed, we can send out a replacement card for $5. It is the owner's responsibility to protect their CRAWL CARD balance. We are not responsible if a stolen card is fraudulently used in your name. If your CRAWL CARD is stolen or misplaced, we recommend immediately calling in to notify us of the situation. Your balance is safe on our system but it is the CRAWL CARD owner's responsibility to maintain it. In the event we ship the wrong part or the part is defective, we will refund the product in full or exchange it for a product of equal value. A restocking fee of 20% applies to orders returned within 30 days. We do not accept any returns outside of 30 days, sorry no exceptions! The 30-day time frame begins once the order has been shipped. Returns and exchanges must be shipped back with a copy of the invoice. Shipping charges for returns and/or exchanges are the responsibility of the customer. For any return shipping on wrong or defective merchandise, a return shipment tag will be provided if applicable. The correct replacement part will be sent out ASAP using the same shipping method as originally ordered. Expedited shipping may be available at an additional cost. If you order the wrong part, then you are responsible for any return shipping costs and the return is subject to a restocking fee. We will not refund or exchange any parts that have been used, installed or modified in any way. Special orders and used parts are not refundable - double check with the sales rep to make sure that you know what you are ordering. A refundable core charge is applied to some major drive train components (ex: transmission, transfer case and differential). Customers have 60 days from the date their original purchase shipped date to be eligible for a core refund. Refunds are based on a complete tear down and inspection of the components. All pieces of the component have a specific value. Therefore, damaged or worn parts will be deducted from the refundable core amount. Cores must be shipped back with the supplied RED core return tag attached. Core returns must be shipped back in the same manner and configuration as originally shipped. Transmission, transfer cases and differentials must be drained of all oil. Both UPS and FedEx charge us a $75.00 "Hazardous waste" cleanup charge from any leaking packages which will be your responsibility to pay. So please drain oil: It saves both of us time and money! Return shipping of core is the customer's responsibility. A FedEx return service tag can be purchased if specified at the time of order for an additional amount. Cores are processed every Thursday. Once processed, a refund check will be mailed within 2 weeks. Refunds are sent out on Thursday's through the post office using the original billing information (for security purposes), no exceptions. Refunds are only available for orders that were shipped no more than 90 days ago. Once processed, a refund check will be mailed within 2 weeks. Refunds are sent out through the post office using the original billing information (for security purposes), no exceptions. We offer a warranty on Marlin Crawler Brand products which covers defects in materials and craftsmanship prior to installation for a period of one (1) year from shipping date of invoice. Products manufactured by other companies but sold through Marlin Crawler will have the manufacturers warranty unless otherwise noted. This warranty is extended only to the original purchaser. Labor costs to R&R components and down time of vehicle is not covered under this warranty. We must inspect the product before we can properly determine if the damage was caused by quality of material, craftsmanship, incorrect application, installer or user, etc..... Shipping is the responsibility of the customer. Product that is found to be defective and able to be warrantied will be replaced or repaired. Replacement product will be sent back via FedEx standard ground at no cost to you. Faster shipping methods are available at an additional charge. The products we sell are intended for off-road Rock Crawling and racing. Both of these sports are extremely dangerous and require a great deal of driving experience. Some after market products alter the vehicle's OEM specifications, making the vehicle's OEM handling characteristics unstable. Modification of certain after market accessories may be required in the form of welding and fabrication, and should only be performed by a certified fabricator. If you are not competent to perform these tasks - Then Don't! Seek out professional assistance. You, the customer, will accept any and all liability for the use of our products. Marlin Crawler will not accept responsibility for personal injury or damage arising from the failure of any parts manufactured or sold by Marlin Crawler. If you do not accept the responsibility, then do not use these products. We do not sell, rent, loan, trade, or lease any personal information collected at our site or by our business, including contact forms, download requests, sales orders, or email lists. We actively monitor and analyze our website usage for improvement and website revisions. This information is not personally identifiable, and Marlin Crawler makes no attempt to link any information with the individuals that actually browse the site. Newsletters are sent periodically to subscribed users. We do not sell, rent, loan, trade, or lease the addresses on our newsletter to anyone! In addition, we configure our list server software to refuse to divulge the email addresses of our list subscribers to anyone. Unsubscribing from our newsletter is very easy. Please click here to remove your subscription from our newsletter. Resubscribing is just as easy, and you may unsubscribe or resubscribe at any time! Our policies help us both!